Last week we had over 30 runners brave the cold wind heading up to Wakefield. Icicles were even spotted on a runner! Good news for this week though, it should be above freezing as we run our last Sunday run of January. 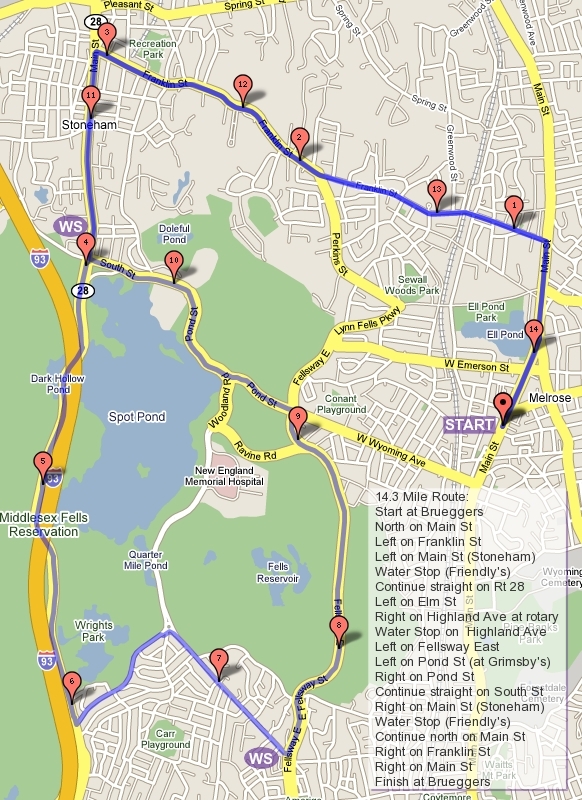 This week we trace the route of the old Melrose Half Marathon. Heading up Main St, cutting down Melrose St and onto the LynnFells Parkway we’ll cross the starting line of the Melrose Law Enforcement Half, run in March back about 10 years ago. From the Beginning, the route will loop Ell Pond with lefts on Tremont, Lake, Emerson, Main, Melrose, and the LynnFells Parkway. (If you’re running with Michelle Palmer, and you were alive in the 70’s, feel free to mention the significance of being at the corner of Emerson and Lake with Palmer). This time down the LynnFells cross Tremont and continue along the Parkway to Grimsby’s. We’ll have a quick little water stop there for you. If you’re running shorter, you’ll skip the loop of the pond and head straight to Grimsbys. From Grimsby’s Â continue over to the Fellsway East and enjoy the hills as we retrace the route from two weeks ago. Turn right on Highland and hit the water stop. If you’re running short you’ll head back along the front side of Spot Pond and run back to Brueggers via Pond St past Grimsby’s onto Wyoming and a left on Main St. If you’re running long you’ll loop Spot Pond just like you did last time, left on Elm at the rotary, right on the Fellsway West, cut through the Straw Point Parking lot, past the Zoo and back to the water stop. From the water stop you’ll take a left on East Border Road, take a moment to curse at the hill or at me or at both, then turn left onto the Fellway East and rerun those two hills that got you out here. Continue back on the LynnFells Parkway past Melrose High School. If this were the race, and the track were still there, Â you would then run a lap around the track with legs worn from the hills in front of a crowd of people. Instead though head back to Melrose St, turn right and right again onto Main St. Finish up with a strong run into Brueggers. So that’s what’s on tap this week. I’ll need some help with water stops. Let me know if you’re interested and what you plan on running and we’ll figure it out. I plan on being at Highland Ave and running the loop of the pond. I could use a car at Grimsby’s and maybe one at Straw Point. So who’s in?! ROLL CALL!!! Last week we had about 24 runners brave the low temperatures (3 degrees, -15 wind chill at the start) and get in between 7 and 12 miles. Not only did the adverse weather test you, but that route was chock full of hills as well. This week we step back a notch, in distance, hills, and weather. The long distance is 10.7 miles, the shorter is 6.2 miles. The route is flat, along Main St out to Wakefield. The weather, while there may be a little snow on the ground, will be milder, hovering around 32 degrees. We’ll start from Brueggers at 8AM, heading north along Main St into Wakefield. This will bring us all the way to water stop 1 at Nick’s Pizza at the corner of Main, Nahant, and North Ave. This is the 5K mark. Shorter distance runners turn around and head back the way they came. Longer runners continue along Main St, through Wakefield Center, to Lake Quannapowitt. Continue on Main St along the lake, and circle the entire lake counter-clockwise until you get to Common St in front of the big church, where you turn right and merge back onto Main St. This will bring you back to the water stop. From there you head back south on Main St, back into Melrose, back to Brueggers to finish. Water Stops, at this point I think I’ll be parking at Nicks and joining in the run there so I have the water stop covered. Thanks to all that have volunteered this year, your opportunities are coming up soon. I considered changing this weeks run to Saturday for two reasons: (1) To set the record for consecutive Sunday Runs on Saturday, and (2) so we can all stay up late to see the Patriots put an end to this Tebow stuff. But neither was enough to move the run this week. So this week we’ll be running our first Sunday run of the season on Sunday. This week’s run will stretch out your miles some in our first of many trips to Spot Pond this season. We’ll head up Wyoming Avenue to Grimsby’s and take a left onto the Fellsway East. If you haven’t run here before you’ll be introduced to two long challenging hills. If you have been here before you’ll be mumbling under your breathe questions about why I make you run these things. But in no time you’ll be on the other side of them, running to a rotary where the Fellsway East meets Highland Ave. Take a right on Highland Ave and make your way up towards Spot Pond. There you’ll find water stop #1. From the water stop, shorter distance runners will continue straight past a rotary by Flynn Rink along the eastern edge of Spot Pond. Since this is Melrose-centric I refer to this as the “Front” side of Spot Pond. You’ll head up to Pond St where you’ll turn right bringing you back down to Grimsby’s. A left there along the Lynn Fells Parkway to a right onto Melrose St, and another quick right onto Main St and back to Brueggers will finish up your 7 mile run. Those in need of a short cut, go straight at Grimsby’s Â back to a left on Main St to Brueggers for 6 miles. Those running long will leave the water stop and go left at the rotary onto Elm St. This will take you down towards Rt 28 where you’ll go right up what we have dubbed Slackers Hill. This is where Slackers may choose to take a little walking break… but we don’t have any slackers, do we? Continue around the “back” side of Spot Pond, under I-93, past the Sheepfold, over I-93 to the Straw Point parking lot. If you don’t know, this is the parking lot/cut through before the intersection where Friendly’s and Mobil is. Cut through the parking lot over to Pond St and follow it past the Stone Zoo, along the front side of Spot Pond, straight onto Woodland Rd and back to the water stop. From there you’ll take your first left onto East Border. Those mumblings under your breathe will now start being expressed louder as you climb a short steep hill, turn left onto the Fellsway East and rerun those first hills coming back, running past Grimsby’s onto the LynnFells Parkway, over one more big hill, past Melrose High School. Take a right onto Melrose St, a quick right onto Main St, and you’ll find yourself back at Brueggers in no time! I will be handling the water stops this week. There will be just the one on Highland Ave. Thanks to all that have volunteered, we’ll have plenty of opportunities coming up for help. Due to the MRC Holiday Party on Saturday night, we’ll be running on Saturday morning this week as well. Starting next week we’ll start running on Sundays. I promise. This week is a slight step up from last week. We’ll be doing 9 miles for the long run as we ease into marathon training distances. Up the LynnFells Parkway to the Saugus Entrance to Breakheart. One loop around the outer loop if you’re going long. Once you’re finished with the loop head back the way you came. There will be a water stop at Breakheart to hit at mile 3 and mile 6. It will just have water and gatorade, like last week. I can’t stay for the stop, so I’ll need some help. Any volunteers? Also, Roll Call! Who’s in?